Does a “basic” compact utility tractor really have to come at the expense of performance or capability? Not when it’s a John Deere. Handle basic chores without compromise with the new 3E Series tractors.With up to 38 engine horsepower, standard high-capacity hydraulics, four wheel drive, hydrostatic transmission, TwinTouch™pedal controls, and a versatile category 1 3-point hitch, the new 3E Series is one surprisingly capable compact. And not only does it still fit in a standard seven foot garage, but it also fits in a standard budget. Recommended for Homeowners, Estate Owners, Horse Enthusiasts, Ranchers, Hobby Farmers, etc. 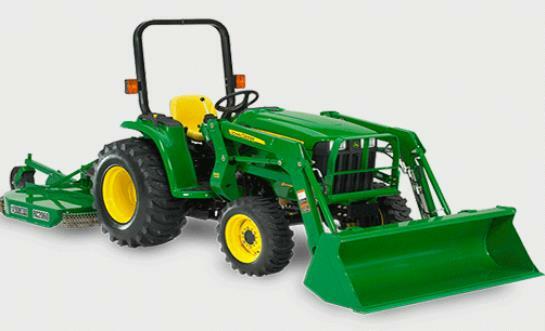 Ideal for loading, mowing, tilling & snow removal.